TASVG Newsletter Issue #2 is available for download. 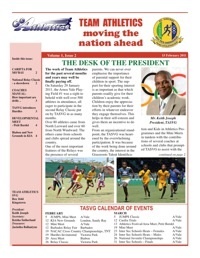 TEAM ATHLETICS St. Vincent and the Grenadines (TASVG) is pleased to introduce to you our newest contribution to the development of Athletics in St Vincent and the Grenadines, our Newsletter. President of the Commonwealth Games Federation (CGF), Michael Fennell, of Jamaica, finally officially presented Natasha Mayers with her gold medal won at the recent Commonwealth Games in Delhi, India. 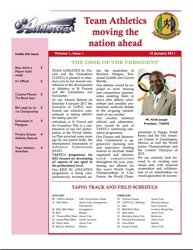 Fennell, who was the guest of the St Vincent and the Grenadines National Olympic Committee (NOC), made the presentation after delivering the feature address at the joint National Olympic Committee/Team Athletics St Vincent and the Grenadines (TASVG) Awards Ceremony held at Frenches House on Saturday last. 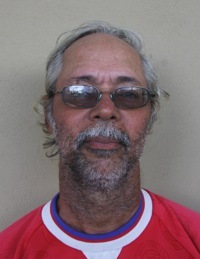 Ian Sardine and Sabrina Mitchell-Sutton were recipients of awards from the International Olympic Committee (IOC) when the National Olympic Committee (NOC) joined forces with Team Athletics St Vincent and the Grenadines (TASVG) for the 2010 Awards Ceremony. Sardine (2009) and Mitchell-Sutton (2010) were duly recognised for their respective years of unswerving commitment to the development of sport amongst the youths within their respective communities and across St Vincent and the Grenadines. For this they were each presented with an IOC Youth and Sport Trophy. The following athletes have been selected by Team Athletics St. Vincent and the Grenadines for training during the period 2010 through to 2014 as part of the organisations' Athletics Academy. The names of selected senior athletes will be announced at a later date. Team Athletics SVG started its 2010 Cross Country and Road Racing season on Sunday 26th September 2010 with the Annual Round D' Town Road Relay.